I’m very sorry to report that Vic Sadot, the “Truth Troubadour,” passed away this past weekend of as-yet-unknown causes. Vic Sadot was Chair of the Social Justice Committee of the Berkeley Fellowship of Unitarian-Universalists. 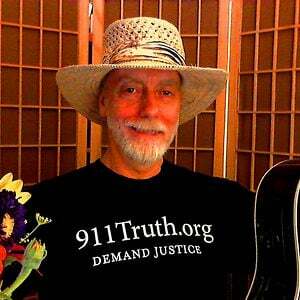 He was also an intensely committed 9/11 truth activist who infused his music with humor and outrage. I met him in 2005 at the Truth Emergency Convergence in Washington, DC and was struck by his ebullient and fiery spirit, and his outrage at the lies and injustice that were reaching monumental proportions. That outrage, and his acerbic creative response, never subsided. In this special episode of Truth Jihad Radio (recorded in less than ideal “studio conditions” in Tarragona, Spain) I will speak about Vic for a few minutes and then play some of his best songs. Vic’s life will be celebrated at 5:30pm this Saturday October 13, 2018 in the Community Room at Redwood Gardens, 2951 Derby St. in southeast Berkeley, California. This show was broadcast on October 10, 2018. This entry was posted on Tuesday, October 9th, 2018 at 4:18 pm	and is filed under 9/11, Anti-War, Censorship-Propaganda, Death Squads, Debt Slavery, Disaster Capitalism, Education, False Flag/Fake Terror, Freedom, Geopolitics, Globalism, Immigration, Israeli spying and influence, Justice, Kevin Barrett, Law, News, Protest, War Crimes. You can follow any responses to this entry through the RSS 2.0 feed. My condolences to all his family and friends. I remember doing a FFWN show with Vic and we communicated a few times by email exchanging Info.